In September 1972, the Diocesan Assembly of the Alaskan Diocese voted unanimously to establish a pastoral school for the training of Alaskan clergy. 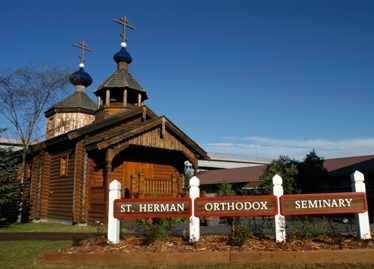 Without funds, without buildings, without faculty, and even without a resident bishop, the faithful and clergy of the largest and oldest diocese of the Orthodox Church in America resolved, with God’s help, to take a leap of faith that would result in the foundation of St. Herman Theological Seminary. On September 24, 2002, 208 years to the date after he arrival of the first Orthodox missionaries from Valaam, the log chapel of the seminary was consecrated, which is a replica of the original church built in Kodiak for the missionaries in 1795 by the Russian America Company. This small but impressive chapel stands not only at the heart of the seminary grounds, but also as the center of the lives of the seminarians and their families who make the often difficult trip to Kodiak to prepare themselves for service in the Church. St. Herman Seminary is currently engaged in an effort to adorn the Synaxis of the Saints of Alaska chapel with icons which will inspire generations of students who pass through the seminary’s doors. You, your family, parish or church organization can help St. Herman Seminary by sponsoring one or more of these icons. A complete and up-to-date list of icons is available by calling Archpriest Chad Hatfield, the Seminary Dean, at: (907) 486-3524. He will be glad to help you select an icon which will then be placed in the seminary chapel. St. Herman Seminary needs funds to provide scholarships for its students and to keep up with the constant and expensive maintenance of its facilities. Please join us in our mission to provide trained clergy and other Church workers for the Mother Diocese of the Orthodox Church in America. St. Herman Seminary offers a four-year program of theological, liturgical, patristic and Biblical studies leading to a diploma. Freshman Year: A one-year program designed to prepare candidates to serve as readers and singers, using Alaskan and Russian chants. Prerequisite: High school diploma or equivalent. Sophomore Year: Reader Certification A one-year program concentrating in greater depth on Biblical studies, Church history and doctrine to prepare teachers and catechists. Diaconate Program: A one-year program providing a higher level of theological education, practical liturgical experience, training leading to certification in substance abuse counseling, and religious education. Prerequisite: Completion of the Sophomore Year, with the Dean’s permission. Priestly Formation: A one-year program with an emphasis on pastoral ministry and theological education. Students will be mentored in prison and hospital ministry as well as in parish life and administration. These classes are held at the Anchorage Campus. Prerequisite: Completion of the Diaconate Program, with the Dean’s permission.